At the 2016 Detroit Auto Show Mercedes celebrated the 130th anniversary of AMG S63 4Matic Cabriolet by unveiling the special edition model Mercedes-Benz S63 AMG 4Matic Cabriolet Edition 130 2016. Limited to just 130 units, the model is supposed to be special indeed to make the glory worth all the stars. Let us have a look at the review of Mercedes Benz S63 AMG 4Matic Cabriolet Edition 130 2016 to know in detail about it. The interior of Mercedes Benz S63 AMG 4Matic Cabriolet Edition 130 2016 is as special and luxurious as it should be coming from the house of Mercedes. Let us start with the Nappa Leather upholstery which comes in two contrast options; Bengal Red and Black or Crystal Grey and Black. The dashboard is a clean design being carried over from the standard model however the multi function steering wheel now has the ‘AMG Edition 130’ engraved on the middle of the steering wheel and the center console lid. It isn’t all about the looks inside, the interior of Mercedes Benz S63 AMG 4Matic Cabriolet Edition 130 2016 also has floor mats that come giving contrast to seat color. In all I would just say that the new upholstery options and the ‘Limited Edition’ badge, undoubtedly makes the model worth your entire penny. The exterior of Mercedes Benz S63 AMG 4Matic Cabriolet Edition 130 2016 doesn’t brings much changes but it still has enough to make it look distinct. Let us start with the painting first. The model comes dipped in specially amalgamated Alubeam Silver finish and has a convertible roof made out of fabric. The indoor car cover is tailor made and features ‘Edition 130’ embroidered over it. Rolling the model is set of new Matte Black 10-spoke wheels with red brake calipers adding to the overall contrast. Apart from these rest all remains same in context to the exterior details of Mercedes Benz S63 AMG 4Matic Cabriolet Edition 130 2016. Being pretty loyal, not many changes were required; being a limited edition those integrated are sufficient to make the model look special. Beneath the hood of Mercedes Benz S63 AMG 4Matic Cabriolet Edition 130 2016 will sit a 5.5 liter Biturbo V8 engine rumbling total output of 577 hp and peak torque of 900 nm. 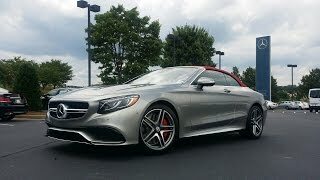 The top speed of Mercedes Benz S63 AMG 4Matic Cabriolet Edition 130 2016 isn’t shared but we do know that the model can sprint from 0-60 mph in just 3.8 seconds.